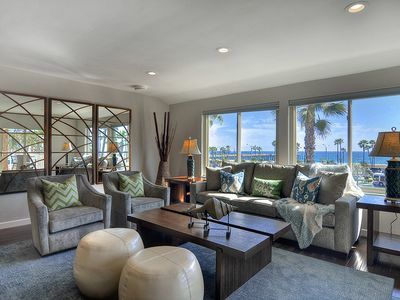 Huntington Beach Vacation Rental, Dolphin House opened on November 1, 2016, after a 7 month renovation, the “Dolphin House Huntington Beach” is the newest VRBO in surf city and we invite you to check out the pictures and take the “virtual tour” just google "Huntington Beach Dolphin House"
We imagined a vacation destination where families, couples and friends could gather around large tables with food, laughter and conversation. 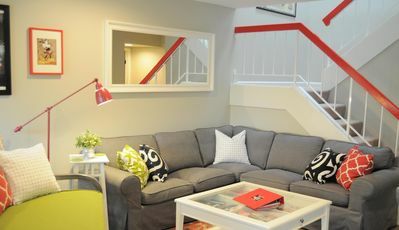 A comfortable and fun atmosphere, the Dolphin House resonates with the “Surf City” lifestyle. You are surrounded by dazzling murals, sea-scapes, stain glass and beach décor. 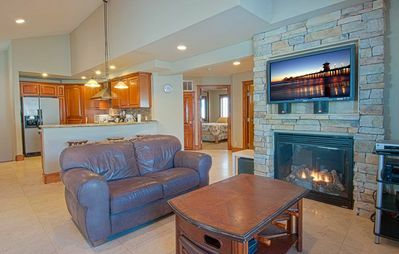 Located about a mile from the Heart of Huntington Beach, a short bike to the pier, the Dolphin House offers quick access to; the beach, Main Street bars, restaurants, Pacific City Shopping, all the major highways and venues like Disneyland. 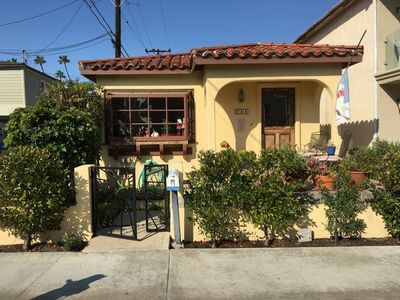 It's in a quiet neighborhood where you will enjoy the afternoon sea breeze while taking a break from the seasonal crowds and frenzied pace of downtown. Our neighbors are quiet too and need to be respected. 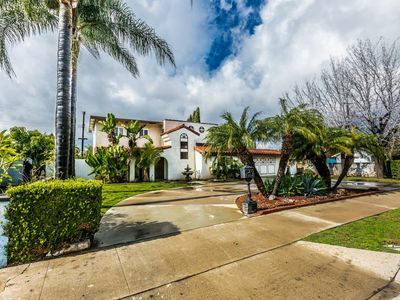 So if you are looking for a party house, this is not the home for you. 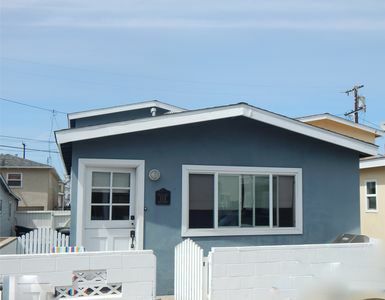 A ranch style home that offers privacy and is friendly to seniors and beach goers with disabilities, the “Dolphin House Huntington Beach “is approximately 1675 square feet inside with extra dining and living space outside. We are connected to a FIOS WIFI at 150MB 5G download speed. Have your coffee or tea on the front patio which faces the east as you watch the day begin under the grapefruit tree. The antique, mosaic tea table has 2 small chairs and a rocker. Our covered side patio provides shade in the summer and has a track lighting system with a dimmer to create the desired mood for an evening’s romantic meal or glass of wine from the wine cellar. Or makes a quiet spot for reading in the afternoon around the teak table and 6 chairs. The third outdoor space is the "Board Room". And one of our favorite features in the Board Room is the elegant porcelain outdoor shower. Perfect for washing off the beach sand. Also in the “Board Room” for the barbecue King (or Queen) in the group, we have a Char-Broil TRU Infrared propane grill. And you can serve that meal to your clan under the canopy of an 8 foot teak picnic table with seating for 10 of your favorite people. Bon Appetit! And your day would not be complete without testing your skills on the putting green. 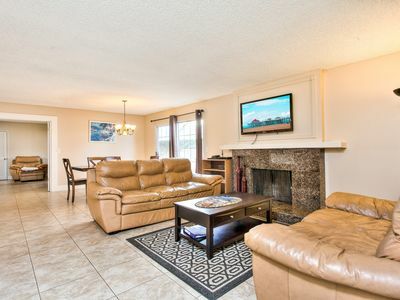 We have a detached 2 car garage and our guests have access to; a modern washer and dryer, bikes (6), a pool table that flips over and become an air hockey table, boogie boards, beach chairs and beach towels, ice chests, wet suits, golf clubs, and anything else we can find that looks like fun. There is also some shelf space for you to store your luggage. Parking is easy around the Dolphin House. The garage is filled with bikes and the pool table but you can park in front of the house, in front of the garage door or in the Cul De Sac behind the garage. There is always room in the Cul De Sac, next to our rear gate. Parking has never been issue, except on July 4th during the parade which starts only 4 blocks away. You will find a work space in the master, just in case the office catches up with you or you need to catch up with the office and set up your lap top. An optional HP printer can be available, if needed, as a part of our concierge service. The master bath has another ceiling fan, 2 elegant basins and a large 7 by 3 foot rectangular shower with shower heads on each end. There is a hair dryer and a tall mirrored cabinet opens to the clothing drawers. Our marble bath has the shower within the 2 person Jacuzzi tub. 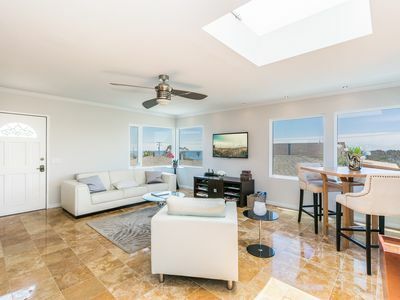 Above the Jacuzzi tub is a 4 by 4 foot skylight which opens to the ocean breeze. There is a hair dryer. 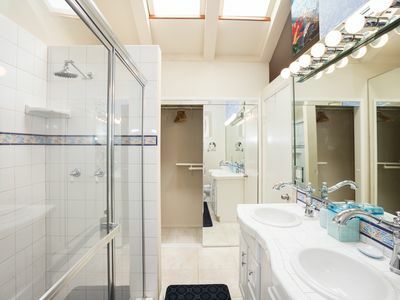 It is a breathtaking bath and the only room in the Dolphin House that is not quite senior friendly in that you take a big step into and out of the Jacuzzi tub. Next to the marble bath is the second bedroom, the Olympic room. 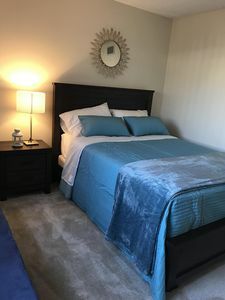 Features; a queen bed with a 3 inch CertiPUR-US memory foam mattress, mirrored closets and a dresser. The third bedroom, the White room, has a unique and lovely full over full bunk bed made of Brazilian pine. Each bunk can hold either one adult under 200lbs or 2 kids. Each mattress is a Signature Sleep Contour 8-Inch Independently Encased Coil Mattress with CertiPUR-US Certified Foam. They measure 54 by 75 by 8 inches. here is a closet and dresser. In this closet you will find an iron and ironing board. 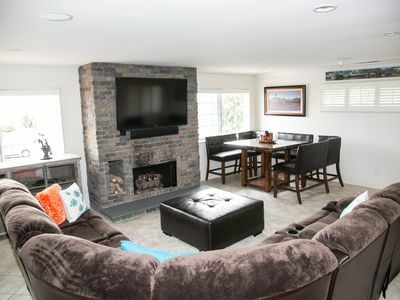 Adjacent to the gas fireplace is a red leather sofa. It folds out into a Queen RV sized bed. The dimensions are 60 by 75 inches. The red sofa looks at another flat panel HD “smart” TV which can stream Netflix, Amazon Prime, Pandora plus much more. In the Dolphin Room you will see 2 life sized Dolphins swimming above a huge, blue, 14 foot “J” shaped couch. It faces a 55 inch ultra-high definition, 4K smart TV. In addition to streaming Netflix, Amazon Prime and Pandora, this TV pulls in hundreds of local and national channels. ESPN, it is all there. Perfect for Sport and Movie watching. Additionally there are 2 loungers on each end of the blue couch. 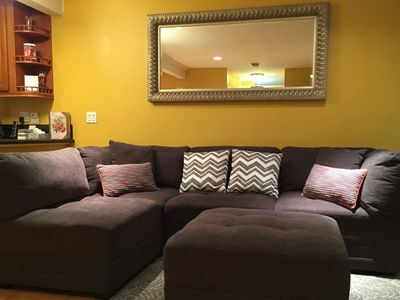 The middle of the blue couch pulls out to a full size bed. Behind the blue couch is a wine cellar that can hold 40 bottles of your favorite vintage. Please advise if you would like to know the location of some fine nearby wine stores. The kitchen has a GE profile gas oven with a warming tray underneath and 4 burners on top. GE profile dishwasher and a quiet garbage disposal. The microwave and coffee maker sit on the granite counter top. With a good assortment of pots, pans and cooking utensils, the chief should be happy but if there are any questions are special needs please advise and we will do our best to accommodate. We have place settings for 12. And finally the kitchen table. This Henredon Historic Natchez Collection Dining table is 8 feet in length and 45 inches wide. It is made from beautiful wood and wood inlay and can seat 8 to 10. The perfect place to begin or end your day. Let us know if we can arrange curb side pickup for guided tours to Hollywood, Universal Studios, The Getty, San Diego Zoo, anywhere you want. And if you would like personal lessons for surfing or stand up paddle board, just let us know. Please advise if you have any special requests and we will try to accommodate. 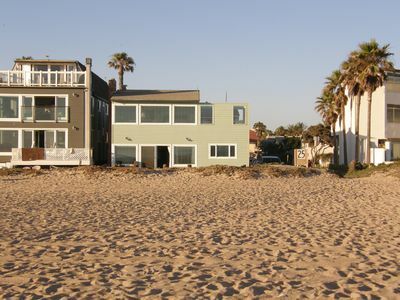 At the Dolphin House Huntington Beach, we sincerely hope that your visit to “Surf City” is a happy and memorable one. Call me or e-mail any questions. 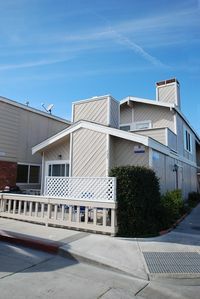 Excellent Location for your Balboa Beach Vacation !! Location, location, location...and 2 balconies? This upper unit has it all! Cozy, Comfortable and only 15 minutes to Disney.